Heat exchangers are essential in a wide range of engineering applications, including power plants, automobiles, airplanes, process and chemical industries, and heating, air conditioning and refrigeration systems. 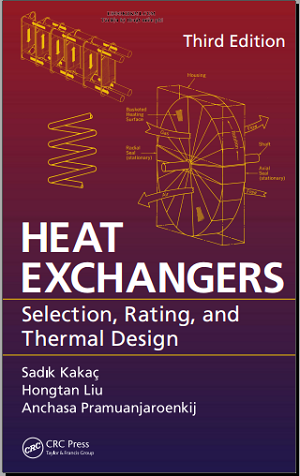 Revised and updated with new problem sets and examples, Heat Exchangers: Selection, Rating, and Thermal Design, Third Edition presents a systematic treatment of the various types of heat exchangers, focusing on selection, thermal-hydraulic design, and rating. This third edition contains two new chapters. Micro/Nano Heat Transfer explores the thermal design fundamentals for microscale heat exchangers and the enhancement heat transfer for applications to heat exchanger design with nanofluids. It also examines single-phase forced convection correlations as well as flow friction factors for microchannel flows for heat transfer and pumping power calculations. Polymer Heat Exchangers introduces an alternative design option for applications hindered by the operating limitations of metallic heat exchangers. The appendices provide the thermophysical properties of various fluids.